Alliance for a Human-Scale City – & Human-Scale NYC, Inc.
**If you are viewing this on a mobile device, please scroll down to sign the petition. We, the undersigned residents of New York City, call for an end to the violence that real estate developers have inflicted on our skyline, parks, public areas, and cityscape with the proliferation of dramatically over-scaled buildings that ignore the historic context of our city. We are angered when developers seize our commonly shared light, air, gardens, and iconic views for private consumption. We are aggrieved when we see developers plunder our historic neighborhoods and bury them in a sea of glass, all for luxury housing that destroys more affordable apartments than they create. We are dismayed that small businesses are being hounded out of their premises by an army of banks and chain stores. Many parts of our city are already too dense such that the public infrastructure in those places cannot support more people without a decline in the quality of life, destruction of historic fabric, and deterioration of the urban experience that makes New York so great. Economic growth and affordable housing are indisputably compatible with both a human-scaled city and the preservation of our historic neighborhoods and architecture. We conclude that reform must take place or the unique character of New York City will be lost forever. We call upon the Mayor and the City Council to prioritize and develop zoning changes, height restrictions, demolition moratoria, strengthened environmental review processes, and to implement regulatory reforms and laws to guide future development towards a human-scaled future – one that protects rather then destroys New York’s historic fabric. We ask that appointees to regulatory bodies be free of ties to the real estate industry and that the revolving door between regulatory agencies and the real estate industry be shut. We call for widespread public debate and referenda on these policies and discussion as to what kind of planning is needed to realize a human-scaled city. 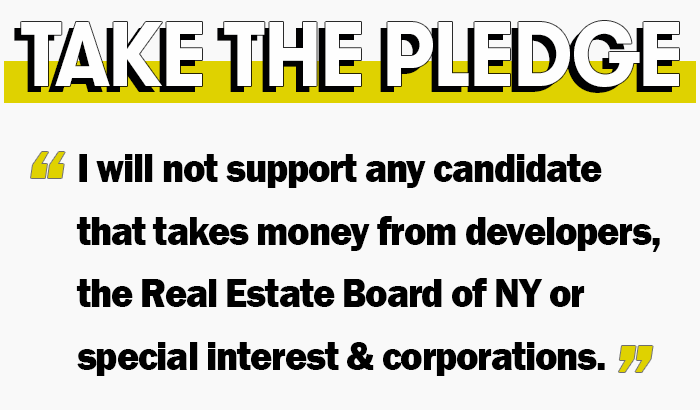 We also call on the political clubs to field candidates for all offices who are willing to challenge the power and influence that the real estate lobby has accrued within our government. If your organization would like to be a co-sponsor, please email coordinator@humanscale.nyc. New York residents only, please. Each signature and comment is sent directly to the Mayor. We promise: no spam or selling of your information.